Women worldwide are making our cities more equitable, inclusive, and sustainable places to live. This International Women’s Day, salute the women leaders working to transform your city. 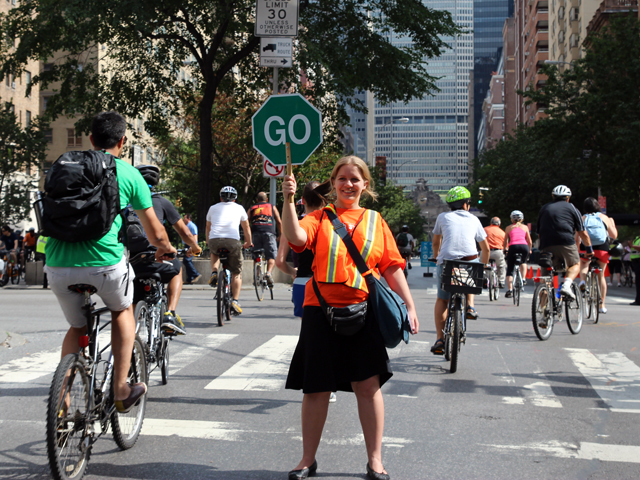 Photo by New York City DOT/Flickr. International Women’s Day is on March 8, 2015, and this year’s theme is “Make It Happen.” Nowhere do women make it happen more than they do in cities. In cities all around the world, women are working to improve the lives of other women, whether by improving access to transport and jobs, making public spaces safer, improving environmental quality, or turning up the volume of their voices by increasing women’s representation in government. In honor of International Women’s Day and all the women doing great work in cities, here are four leaders hard at work transforming our cities. 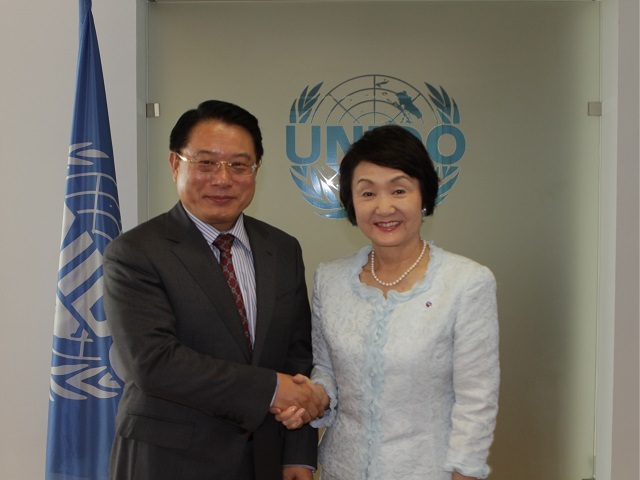 Fumiko Hayashi, Mayor of Yokohama, Japan, meets here with UNIDO Director General Li Yong. Mayor Hayashi has received international attention for her childcare advocacy. Photo by UNIDO/Flickr. In 2009, Yokohama—Japan’s second largest city—had the most children on childcare waiting lists in the country, a surprising yet widespread barrier for new mothers trying to re-enter the workforce. Newly elected mayor Fumiko Hayashi was determined not to let the women of Yokohama opt out of the workforce for that reason. In three years, Mayor Hayashi eliminated the daycare waiting list in her city through numerous strategies, including increasing government support for childcare facilities, opening new facilities, and improving working conditions for childcare providers. Katherine Gajewski leads Philadelphia’s Greenworks program, which aims to increase health and happiness through environmental sustainability. Photo via City of Philadelphia. 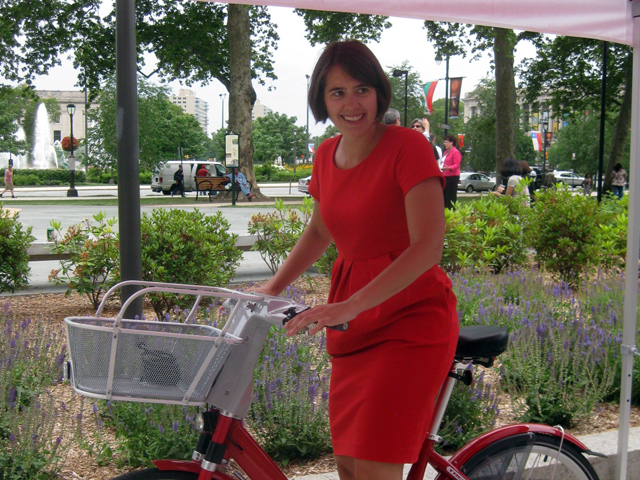 Since Mayor Michael Nutter took office in 2008 and established the Mayor’s Office of Sustainability, Director Katherine Gajewski has been creating real change for Philadelphians through her ambitious Greenworks plan. This plan has either reached or made progress toward 98 percent of the city’s 2016 targets in energy, environment, equity, economy, and engagement. Included in this wide scope of work are initiatives aimed at growing access to open space and fresh food, and planting trees in neighborhoods without a healthy tree canopy. Initiatives like these point to the importance of having diverse representation in governmental decision making processes so that resources and amenities are distributed equitably. Women are heavily represented in this field. It’s incredibly balanced in a way that is very different from some of our related fields, such as engineering or architecture. I am lucky to have a lot of female counterparts working in cities all across the country. We have talked together about why there are so many women in sustainability. It’s hard to say for sure, but I think the fact that it’s such an interdisciplinary topic that requires working across issue areas and building consensus between diverse stakeholders speaks to women. I love knowing that women are at the table leading the charge to make cities more healthy, livable places to be. 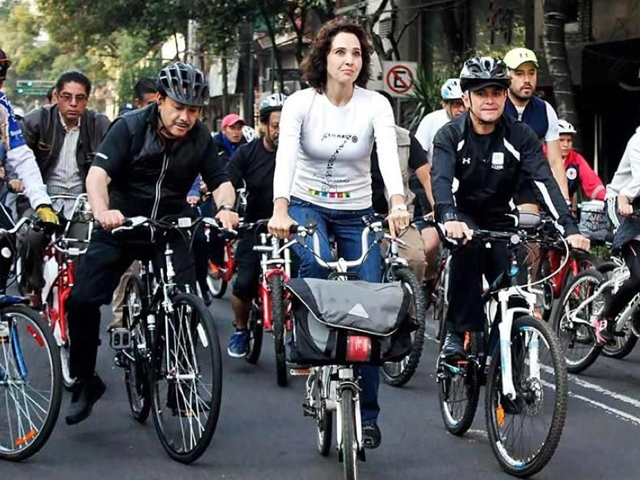 Tanya Müller (center) leads Mayor Miguel Ángel Mancera (right) and Secretary of Government Héctor Serrano (left) on an ECOBICI bike ride through Mexico City. Photo by Elizabeth Vásquez/Reforma. Tanya Müller is leading the charge towards a cleaner, more livable Mexico City. Women are especially susceptible to the harmful cardiovascular, bone, and lung impacts of air pollution and other environmental pollutants. Secretary Müller has been the driving force behind Mexico City’s Plan Verde, a multi-dimensional plan to improve all aspects of the city’s environmental health. Two key initiatives under Plan Verde are working to expand the city’s green roof cover and to increase the number of people using alternative transport modes. In 2013, Secretary Müller and her team increased the total area of green roofs in the city to 21,949 square meters, all the while improving air quality and educating children about nature. Secretary Müller’s mobility initiatives have included air quality-based private car restrictions, expansion of the city’s bus system, and investment in the ECOBICI bike sharing system. ECOBICI, in particular, is a boon for Mexico City’s women: since current mayor Miguel Ángel Mancera took office in 2012, women’s usage of ECOBICI has increased from two in ten to four in ten. 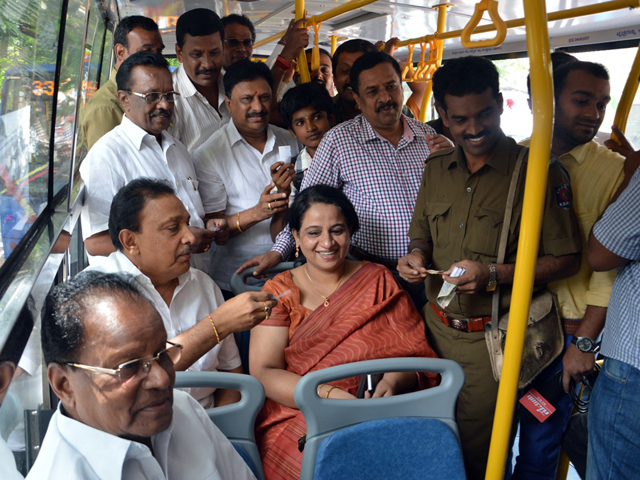 Ekroop Caur (center) joins citizens at the launch of Bangalore’s redesigned BIG bus network in 2014. Photo by BMTC. The Bangalore Metropolitan Transport Corporation (BMTC), under the leadership of Managing Director Ekroop Caur, has recently introduced several initiatives to improve women’s safety and proactively encourage more women employees. By installing separate boarding for women, CCTV cameras and panic buttons in buses and bus stations, women’s only buses during rush hour, and GPS tracking, Caur has helped create safer environments for women traveling on BMTC buses. In addition, the BMTC has over 1,200 women conductors and operational staff members, including a dedicated counselor to addressing issues for women in the workplace. Gender sensitization workshops are held periodically for all crew and staff members. By making transport in Bangalore safer and more accessible for women, Caur is creating a city where women have greater opportunity and independence to live the lives to which they aspire. On this International Women’s Day, we say thank you to all the women who have inspired us to create change in cities. Cities are the future, and women have a key role in creating an urban future that is more sustainable, prosperous, and equitable for all. Who are the women that inspire you to create change in your city? Let us know in the comments!